Lake Geneva or Lake Léman is a lake in Switzerland and France. It is one of the largest lakes in Western Europe. 59.53% 345.31 km2 (133.32 sq mi) of it comes under the jurisdiction of Switzerland (cantons of Vaud, Geneva, and Valais), and 40.47% 234.71 km2 (90.62 sq mi) under France (Haute-Savoie). The average surface elevation of 372 m (1,220 ft) above sea level is controlled by the Seujet Dam in Geneva. 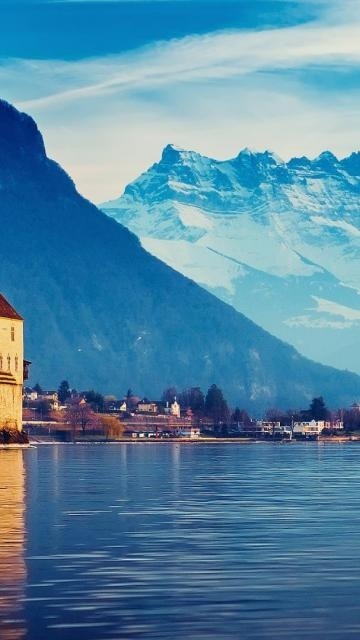 Lake Geneva, formed by a retreating glacier, has a crescent shape that narrows around Yvoire on the southern shore. It can thus be divided figuratively into the "Grand Lac" (Large Lake) to the east and the "Petit Lac" (Small Lake) to the west. The Chablais Alps border its southern shore, the western Bernese Alps lie over its eastern side. The high summits of Grand Combin and Mont Blanc are visible from some places. Compagnie Générale de Navigation sur le lac Léman (CGN) operates boats on the lake.